How can feng shui and changing colors help you adjust to each season? What effect do you have on your environment? The Home Discovery Show's Ian Power and I talk color, lighting and what it means for newly budding spring. Check it out! IP: Home Discovery Show is on the Corus Radio Network. My name is Ian Power. I want to bring in Anjie Cho, a holistic interior architect and author, sought after expert in the fields of Feng Shui and Green Design. A registered architect and certified Feng Shui practitioner, Anjie creates beautiful spaces throughout New York and beyond. The entire world is yours Anjie. Nice to have you on with us again. AC: Hi Ian, so nice to be back. Your book is already a best seller. Congratulations. That’s quite an accomplishment! That also tells us that there’s a huge interest in the things that you do and you talk about. 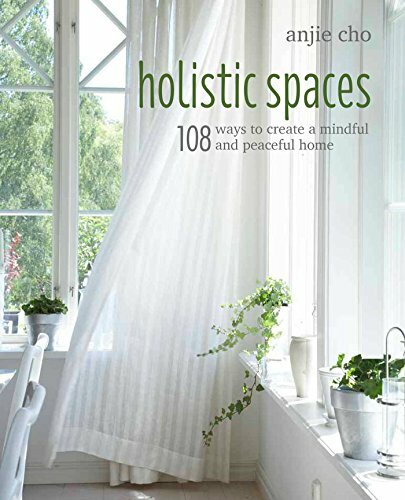 Your book is 108 Ways to Create Holistic Spaces: Feng Shui and Green Design for Healing and Organic Homes. Just a quick overview on your book. Well, my book is 108 tips in which you can incorporate Feng Shui and Green Design principles in your home. Simple things like what colors mean and what they symbolize or how can you save water in your bathroom, just small little digestible bits that are easy to implement so you really have no excuse not to do it. Excellent. What’s happening in New York right now? You’re in New York. Is it snowing, raining, slitting? It is getting a little bit warmer. It’s still pretty cold. It’s 40 degrees; I don’t know what that is in Celsius, but the snow is gone. It did snowed on the equinox though, which was a couple of days ago. Well, here we’ve been in full on spring mode for at least a couple of weeks and last time we spoke, we wanted to get you back during spring to talk about color, because I know that’s really important. What is the relationship between spring, color, Feng Shui and how it relates to interior design? Can you talk about that a little bit? Sure, of course. Humans are very visual. We’re very visual people, so color is a really great and easy way to change the feeling of your home and to change the mood in your home. So you could either do that with paint or adding accents, and spring is a great time to kind of refresh things. Spring is about new beginning and starting anew, so great spring color is green. Greens are really healing and they represent growth, and blues are also similar to greens. Blues and greens are both very comforting and they’re healing, because they actually remind us of the natural world, and the wavelengths are actually shorter, so in a physical way, it’s more comforting to our eyes. That’s interesting. When you say blue, most people, when you just say the word “blue,” they think of the “blues” and they also think that blue, the color, is a little bit colder. Well, it really depends on what shade of blue of course, right? So grayer blues can be cooler and maybe more depressing, and if you have that thought when you think of the color blue, then definitely go for green which is more hopeful. But we’re also talking about summer too, which will soon be around the corner, and as it gets warmer, that’s when, actually, blue is really good because it is cooling, and the color blue actually helps to cool down your spaces. Okay. I’m thinking now, I don’t want to paint every season, obviously, so will these colors still work in the winter time when that rolls around eventually? Absolutely. And besides painting the walls, you can add accents into your home through plants or pillows or rugs. Pillows, you can easily change up and plants are green all the time, but green is actually great for all year round because plants reminds us of the seasons, because they usually reflect what’s happening. Indoor plants like a little bit darker green in the colder months and they might start to flower in the spring and summer months, and that reminds us of the change of season. Does Feng Shui play into the colors or the colors into Feng Shui? How does one relate to the other? Feng Shui looks a lot at color and so, again, the colors, for instance green and blue, are very comforting and expansive, and they also represent the wood element. When you think of the wood element, you think of a plant, a plant that’s growing and expanding and growing from a small seed and growing in to huge redwood tree. You think about that growth and going from that energetic little sprout to a big, grounded, supported tree, and that symbolism can affect your life when you surround yourself with things like plants or the colors green and blue, because it encourages the growth and expansion in your life. You do, obviously, residential properties. You also do commercial properties. When you’re doing an office, for example in a commercial property, is there a different technique or different form of Feng Shui applied to, let’s say, a commercial office than, let’s say, your home office? In terms of color? They’re pretty similar, I think your home office and your work office, but for instance, a retail store, you might want more active colors like orange and red. I’m doing a retail store right now that we have a lot of black. You have more opportunities to get more exciting, I guess. In homes and offices, you want something more neutral, because you spend much more time in there and so your mind and your eyes don’t want to be activated all the time. You want to also have some time for rest and relaxation. How about lighting inside the home? What role does that play in Feng Shui? Lighting is really important. One thing that people don’t realize is that light represents the fire energy, so when you have more light and you have a home that’s able to be brightly lit, that represents being able to have more opportunities for advancement and to be able to see. Do you see the metaphor? When you have a lot of light, you can see more clearly what’s coming towards you. And it doesn’t mean that you need to have your lights at full blast all the time, but having the opportunity to clearly see your space around you translates into your ability to see opportunities coming to you and to your life. Sure. And one of the things that, and we have to leave it here, but it must be noted that a lot of what you do, and I don’t know if it’s just your practice, Anjie Cho, if it’s Feng Shui related, but you’re very eco-conscious and you’re very energy efficient in all the things that you do. Well I think that when you say energy, that can go in two ways. That can be a more esoteric energy, but also actual electrical energy, and they go hand and hand. My hope is that people begin to see how you can impact the environment around you and how, in turn, the environment can impact you. Once you realize you have that ability to change the world around you, and it can change you and support you, you really become able to shape a happy and nurturing life. Holisticspaces.com is the website for Anjie Cho, interior architect, author and sought after expert in Feng Shui and Green Design....Anjie, thanks so much for your time. We’re gonna get you back in a short time from now, and we’re going to talk more about this and learn more about what you do. We really appreciate your time. Anjie Cho, HolisticSpaces.com. And we’ll be back in a moment on The Home Discovery Show on the Corus Radio Network. Click here to listen to my other interviews with the Home Discovery Show. Join Ian Power every Sunday from 10 to 11 am PT as he’s joined by experts on home renovations and upgrades, plus the latest tools and tricks from the trades.